The head of a college has been chosen as Labour's candidate to fight the next general election in Scunthorpe. John Leggott College principal Nic Dakin, also a former leader of North Lincolnshire Council, secured more than 50% of the vote in the first ballot. 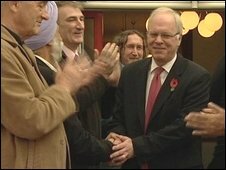 He will replace Elliot Morley, who is standing down as Scunthorpe MP after controversy over his expenses. Mr Morley claimed for mortgage interest payments of £16,000 - 18 months after the mortgage was paid off. Constituency Labour Party secretary Steve Swift said: "I am confident that Nic will be an excellent candidate for Scunthorpe and its surrounding towns and villages. "The result demonstrates that the local Labour Party is fully behind Nic Dakin."